Despite high losses owing to Typhoon Jebi and Hurricane Florence (around EUR300m each), MUNICH Re posted, in Q1-3, a profit of EUR2,038m and is thus on track to achieve its profit target of EUR2.1-2.5bn. The company also highlights a robust growth in property-casualty reinsurance and that the profit guidance for ERGO raised to at least EUR350m, following good Q1-3. The extreme weather events have written another record page last week, when Venice has experienced the worst flooding in at least a decade, with losses estimated at first sight to over EUR 1 billion throughout the Veneto region. MTPL insurers in Russia are likely to compete more strongly on price if further liberalization of the market takes effect next year, FITCH Ratings says in a new report, published on November 5, 2018. Hannover Re increased Group net income by a significant 32.1% as at 30 September 2018 to EUR 725.3 million (EUR 548.9 million) and confirms the profit guidance of more than EUR 1 billion for 2018. For 3Q2018, excluding the impact of Accounting Standards Codification (ASC) 606, Willis Towers Watson (WTW) has reported revenues of USD 6.5 billion, 6% up y-o-y (3% increase constant currency and 4% increase organic), as compared to USD 6.1 billion for the same period in the prior year. The MARSH & McLENNAN Companies (MMC) reported Q3 2018 consolidated revenues of USD 3.50 billion (vs. USD 3.34 billion), up by 5% compared with the third quarter of 2017. The operating income was up to USD 541 million (vs. USD 535 million), while the net income attributable to the company was USD 276 million (vs. USD 393 million in Q3 2017). Nationwide introduction of compulsory health insurance in Azerbaijan was postponed from 2019 to 2020, reports the Analytical and Information agency FINEKO and ABC.AZ. French insurer AXA announced its January-September 2018 total revenues were up 4% to EUR 75.8 billion with growth in all geographies. Bulgarian insurance market" authority - FSC recently published a draft ordinance regarding the MTPL tariffs for MTPL policies, wrote local media. Croatian holding ADRIS Grupa, the owner of the largest and oldest insurer in Adriatic region - CROATIA Osiguranje, announced in a statement its insurance arm generated a gross profit of HRK 403 million (~EUR 54.3 million) during the first nine months of the year, 46% more y-o-y compared to the 3Q2018 figure (HRK 275 million). "By global standards, insurance in Georgia is still immature - in the initial stages really - therefore there are many things that are yet to be done and the market has big potential," Giorgi BARATASHVILI, CEO of ALDAGI, told the FINANCIAL in an interview. During 3Q2018, the Montenegrin insurance market totaled almost EUR 65 million, a 6% increase y-o-y, as the Insurance Supervision Agency has reported. 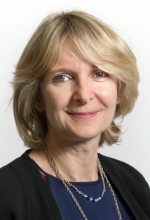 QBE has announced on 31 October changes to its structure in an important step towards further simplifying its operations and building a more streamlined, agile and customer-oriented business. A.M. Best has downgraded the Financial Strength Rating to A+ (Superior) from A++ (Superior) and the Long-Term Issuer Credit Rating to "aa-" from "aa+" of Tokio Millennium Re AG (TMR) (Switzerland). Aon has reported for Q3 2018 total revenues up by 6%, to USD 2.3 billion, including 6% organic revenue growth. The operating margin increased to 11.2%, and operating margin, adjusted for certain items, increased 190 basis points to 18.5%. Net profit of RESO-Garantia from January to September this year increased by 18% y-o-y and amounted to RUB 16.2 billion, as announced by the insurer. Who were the winners of the Golden Shield Excellence Awards? InsureTek Middle East 2018, organized by Biz Events Management and supported by XPRIMM Publications as Media Partner, took place on 7 November 2018 at Hotel Grand Excelsior, Dubai. 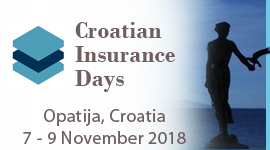 The most important annual meeting of the Croatian insurers, the "Croatian Insurance Days", started today in Opatija, Croatia. On November 1st, an Agricultural insurance conference took place in Skopje, Macedonia, organized by the Insurance Supervision Agency in cooperation with the Ministry of Agriculture, Forestry and Water Economy. Drawing attention to the necessity of reducing the risks in agriculture by using insurance was the event's main purpose.